This recipe for Filipino Kare Kare or oxtails with tripe is from The Frugal Gourmet Cooks Three Ancient Cuisines by Jeff Smith (Wm Morrow). 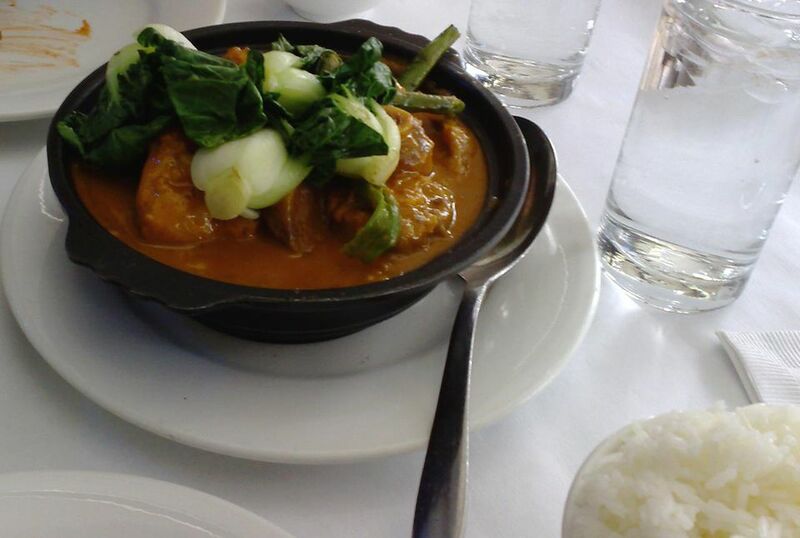 A traditional dish served on special occasions as well as for family dinners, oxtails and tripe are slowly simmered to tenderness before creating the delectable spicy peanut sauce. Heat a large skillet and add 3 tablespoons of the peanut oil. Brown the oxtails well on both sides in 2 or 3 batches. Place them in a 6-quart heavy-bottomed stovetop covered casserole or Dutch oven. While the oxtails are browning, bring 3 quarts of water to a boil and blanch the tripe. Start by boiling it for a few minutes. Cut the tripe into strips 1/2-inch wide and 3 inches long. Add these to the oxtail pot. Add the remaining peanut oil to the skillet the oxtails were browned in and sauté the onion and garlic. Add to the oxtail pot along with the tomato, beef stock, water, salt, and annatto oil. Bring to a boil, reduce the heat, cover and simmer slowly for 1 1/2 hours. Simmer partially covered for another 1 1/2 hours, stirring now and then. While this is simmering, mix together the peanut butter and hot water in a small bowl. At the beginning of the last hour of cooking, add the peanut butter-water mixture and Tabasco. Taste and add more Tabasco and salt if needed. If all is not very tender, continue to cook a bit longer. The type of beef tripe you find in most grocery stores has undergone a bleaching process to make it more attractive-looking to the consumer. For the most part, bleached tripe is free of grit and undigested food, but you still need to rinse it in water several times before it is blanched to remove the chlorine in which it has been bleached. This step varies from recipe to recipe, as in the one above, but in general to blanch or parboil the tripe, place it in a pot, and cover with water and salt. Boil for 10 minutes. Discard the water and rinse the tripe in cold water several times before using it in your recipe.